Our accommodation has been thoughtfully designed to first and foremost blend in with our natural surrounds and to offer different styles and locations to meet the needs of traveler preferences and budgets. There truly is something for everyone at Kings Canyon - and more importantly - no matter where you stay all the wonders of Kings Canyon are on your door step to for you explore. Please note: check-in is after 3pm and check-out is at 10am. Our Resort Rooms are spacious and located in the tranquility of natural bush land. Featuring separate ensuites and a combination of either two double beds or one queen size bed, Resort Rooms are large enough and flexible in design to accommodate between 2 - 4 guests. Interconnecting rooms are ideal for families requiring more space. The Deluxe Spa Rooms, located in the same area, offer private decks overlooking rugged bush land; The view from the luxuriously deep spas looks out onto a rocky escarpment that is subtly lit as evening falls to provide a wonderful ambiance. The Lodge is in the heart of the resort and is a community hub for backpackers and budget travellers. A choice of private or shared rooms are available in double, twin or quad configurations inclusive of bed linen, blankets, refrigerator, television and tea/coffee facilities. 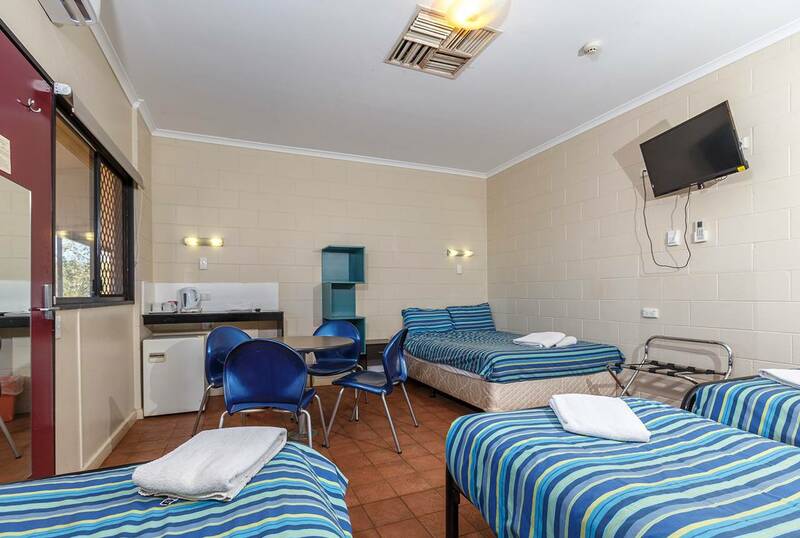 Shared laundry, kitchen and bathroom facilities are conveniently located nearby. Guests will also enjoy the resort's swimming pool, playground and selection of bars, BBQ and restaurants all located within walking distance. 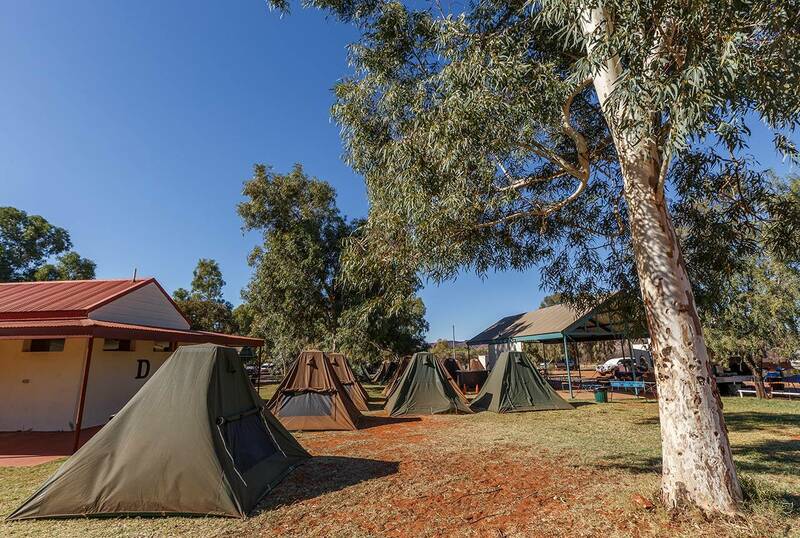 The campground commands uninterrupted views of Kings Canyon and the beauty of its natural surrounds and offers powered and unpowered sites, sites with ensuites and dedicated camping areas. Larger sites are designed to accommodate with ease motorhomes and their are dedicated coach parking bays. The camp sites are set amongst native bush land, most sites enjoying shady periods throughout the day. For planning purposes, powered site outlets are 240.250 Volt/50HzAC and waste dump site is available. What a pleasant surprise Kings Canyon Resort turned out to be. It is set in lovely natural surroundings and our 'deluxe' cabin was great - spacious, modern and comfortable and stylishly decorated in colours that reflect the natural environment. Comfortable beds, roomy and spotless bathroom, nice toiletries - everything was excellent. The restaurant was another pleasant surprise. The menu was surprisingly varied and sophisticated (try the prawn shooters), especially considering the resort's remote location. Service was very friendly although could probably benefit from a few more staff at busy times. Breakfast is good and you can have eggs cooked to order - the omelettes are particularly good. The resort has various accommodation options right down to a camping ground and also runs a store where you can stock up on basics. We really enjoyed our stay here. The spa suites are spectacular and the staff are great along with food & bev & facilities. Carmichael's has the best breakfast & dinner, whilst the pub has the best pizzas. Definitively will be back again!